I have a lovely Polwarth fleece which I imported from New Zealand and I want to spin it worsted, probably for some socks. It’s really very soft with a micron count of about 23 but has a 4 inch staple length so I think I can spin a nice strong and durable 3 ply worsted sock yarn with it. With this fleece I can also spin a fluffy light and warm woolen yarn that will be soft enough for a baby. What a lovely versatile fleece. 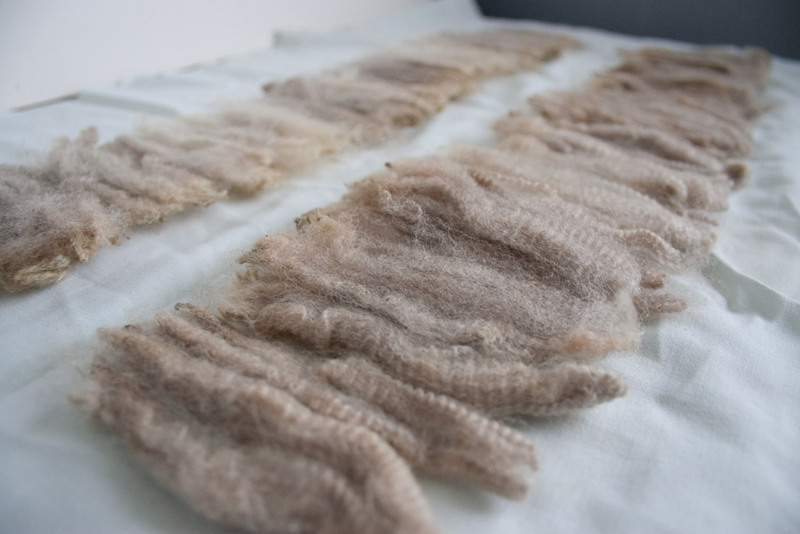 The goal is to wash individual locks of wool that are all the same length and texture so the first step is to pull out the locks individually, sort them out and line them up. Find a old cotton cloth and lay the locks side by side with the tips in toward the center. This is just in case the ends of the 2 rows touch as the tips are much less likely to cling to one another as the cut end. Make another line facing this one (tip to tip) on the other side of the cloth. Fold the cloth over to cover each side, fold in half lengthwise and fold over the ends. You have made a nice secure package for the locks that will not only keep them lined up and intact but will also help to prevent any felting as it keeps the locks from touching one another or moving very much. Get out a pot that will go on the stove top and drizzle a bit of detergent into the botton. Coat both sided of your envelope of locks and fold it up. Drizzle a little more detergent on top and pour the hotest tap water over it until it is covered but not floating. Push gently to immerse the package in the hot soapy water and put your pot on the stove to simmer for 30 minutes. 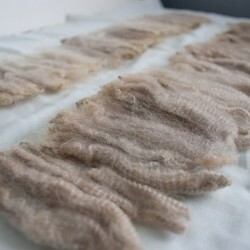 This high heat will take all of the greese out of your fleece and it will be soft and clean. After the time is up you can turn off the element and wait for the water to cool enough to handle your fleece. If you have used detergent for the washing liquid you don’t have to worry about the grease redepositing on the wool. When cooled enough to handle squeeze out as much soap and water as you can and adjust the tap to steam of water that is the same temperature as the wash water has cooled to. If you use water that is colder than your wash water the wool will felt and be ruined. Rinse your wool, still in the cloth package under the running water and squeeze and rinse until you are satisfied with the result. Roll it in a towel to squeeze out excess water, open the package by unfolding and wait for the locks to dry. They will puff up and be so wonderfully lovely you won’t believe it. To spin from the lock now just take a simple dog brush. Hold one lock tightly in you hand and brush the tips out with the dog brush just as if it were hair on someones head. Turn it around and brush the other end. Go to the spinning wheel and being carefull to spin from the very end of the lock spin with tips first by a short draw.